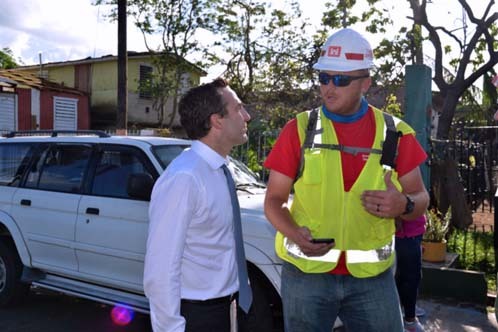 Assistant to the President Reed Cordish, from the White House Office of American Innovation, recently paid a visit to the Puerto Rico Recovery Field Office for a progress update and tour of several mission sites. RFO Commander Col. James DeLapp and several mission managers brought Cordish up to date on the strides the U.S. Army Corps of Engineers has made with temporary power, the Blue Roof program, debris removal and several other mission areas. After the briefing, DeLapp escorted Cordish to the Incident Staging Base on Fort Buchanan where the temporary generators are stored and prepared for installation. Cordish also met with the Task Force Prime Power Team at the Palo Seco power plant, followed by a walk-through of a blue roof assessment in Guaynabo. Focusing on technology and innovation, Jamie Simmons, temporary roofing quality assurance representative, explained the smartphone Field Management System the teams use to collect Rights of Entry and perform assessments. “I explained to Cordish how a QA assesses a house. I covered all the steps we go through to enter information into the FMS operating system,” said Simmons. Simmos gave Cordish a thorough breakdown of the information that residents provide, such as photos of the home and the latitude and longitude coordinates, which helps contractors locate the correct house. Once all the information is entered into the system, contractors are able to determine the quantities of plywood, lumber and plastic sheeting required for the Blue Roof installation. Hey Buddy!, I found this information for you: "Trump envoy tours FEMA PR offices for update, tour". Here is the website link: https://newsismybusiness.com/trump-offices-update/. Thank you.